The aim of the Junior Command Course (JCC) is to train, assess and qualify all Royal Marine JCC candidates for promotion to Corporal. Prior to joining, all personnel will undergo two weeks 'Pre-Juniors' training. Here they will be given refresher training on the various subjects being covered in the course. Once they have completed this they will then move on and undertake the nine-week JCC. The first few weeks centre on improving the student's instructional techniques, physical training and completing some challenging and demanding field exercises. Here they will learn about section and troop level tactics. Then they will be introduced to the orders process and be expected to deliver orders to the rest of the group. The middle weeks are taken up conducting further exercises where the individuals' personal skills are tested to the full. During this time they will have to lead, instruct and take part in various types of field exercises. These range from fighting in urban environments, in woods and forests to open countryside. Throughout the nine weeks they will also develop their physical training ability. All leading to the final week where they will be tested to ensure they have correctly grasped all that has been taught. If successful the newly awarded Corporal will go on to take charge of a section of eight men in a Commando unit or similar depending on his chosen specialisation. The aim of the Senior Command Course is to prepare the individual as effectively as possible for duties as a Sergeant. Therefore, the course is challenging and demanding, requiring preparation and commitment. The primary aim is to train the individual to the best of his abilities. All the instructors are highly experienced and are there to guide all personnel throughout the period of the nine week course. A high standard of personal skills will be expected and assessed during the course. In particular fitness, weapon handling and knowledge, map reading, navigation along with personal fieldcraft will all be tested. Before any individual joins the course he will need to work on all these criteria to ensure he has the best chance of succeeding. The course starts with a two week 'Pre-Seniors' that gives all the attendees time to settle in. Also, to complete some mandatory tests prior to the start of the course. They will then go on to complete seven weeks of demanding exercises, classroom lectures and leadership tasks that must be successfully completed. All individuals will learn about troop tactics, running live firing ranges and undergo command training. They will also learn about the duties of a Troop Sergeant whilst on military operations or when training in the United Kingdom. Some of the course is classroom based, where students will be taught IT skills, defence writing, the Orders Process, and how to prepare and deliver lectures or lessons. The Senior Command Course is short, so a lot is expected of the individual to take in what has been taught, applying it in a professional and efficient manner. On completion of the course, this ability will be much needed if the man deploys on military operations. All successful candidates finish the Senior Command Course with the confidence that they can do the job expected. All with the knowledge that they can complete any task set them with relative ease. The ACC trains selected Colour Sergeants for their future duties as a Warrant Officer 2nd Class (WO2). The course is six weeks long, including a one week computer skills course. 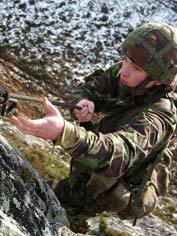 The key Training objectives are to train the Colour Sergeant to administer and manage a company of Marines, to provide advice on all relevant aspects of military law and personnel management, and to upgrade his tactical skills and military knowledge to the level required of a Royal Marine Sergeant Major.